Barack Obama is coming for that Number One Spot. 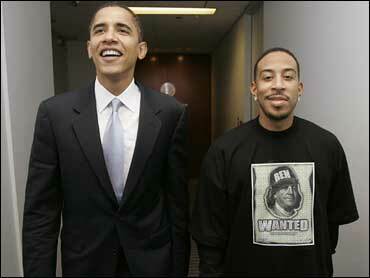 The senator, contemplating a run for president in 2008, met privately with Ludacris on Wednesday. "We talked about empowering the youth," said the rapper, whose real name is Chris Bridges. Ludacris was in town to launch the YouthAIDS "Kick Me" campaign to raise HIV/AIDS awareness during a stop at Northwestern University in the Chicago suburb of Evanston. The meeting at Obama's downtown Chicago office was a meeting of two star powers: Obama, who enjoys rock star-like status on the political scene, and Ludacris, a music superstar and budding actor. They both have won Grammy awards: Obama for readings from his memoir, "Dreams From My Father," and Ludacris for his verse on Usher's "Yeah!" Bridges said meeting Obama, known for his warm personal style, was like meeting with a relative. Obama declined to comment after their meeting, but walked with Bridges to the elevator as he left. The spotlight has been on Obama, a first-term Democrat from Illinois, as he mulls a run for the White House in 2008. Obama has said he would make a decision in the coming months. Ludacris' latest album, "Release Therapy," debuted at No. 1 in September. His numerous hits include "Number One Spot" and the current "Moneymaker." He also has delivered well-reviewed performances in the Oscar-winning film "Crash" and "Hustle & Flow."